One of the highly anticipated movies of 2019 is the Vijay starrer Thalapathy 63 directed by Atlee and bankrolled by AGS Entertainment. The movie also stars Nayanthara, Reba Monica John, Kathir, Daniel Balaji, Vivek, Yogi Babu, Anand Raj and others in prominent roles. This is Atlee's 3rd consecutive film with Vijay after Theri and Mersal. It also marks Vijay's hattrick collaboration with Rahman after Mersal and Sarkar. The film has cinematography by GK Vishnu, and is all set for a release this Diwali. 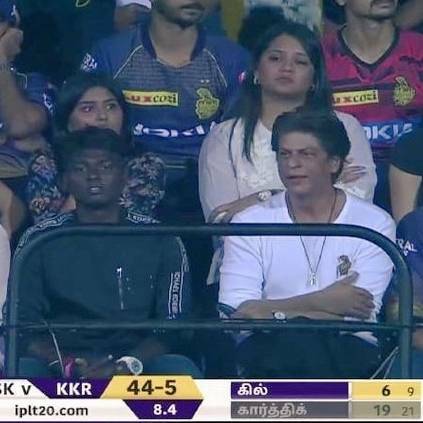 Today(April 9), director Atlee visited the Chepauk stadium to witness the clash between Chennai Super Kings and Shah Rukh Khan owned Kolkata Knight Riders. During the match, Atlee and SRK were spotted having a conversation, following which Twitter went abuzz with rumours of the Bollywood Badshah playing a cameo role in Thalapathy 63. Some went on to say that Atlee will be directing Shah Rukh Khan soon in the Hindi remake of Mersal. However, none of this is confirmed, and this could have very well been a casual chat. But if this happens, it's going to be a special treat for all Thalapathy fans this Diwai. Stay tuned for more updates. People looking for online information on Atlee, CSK, IPL, IPL 2019, Shah Rukh Khan, Thalapathy 63, Vijay will find this news story useful.